In an unthinking free moment at the Norris Museum, St Ives, UK last Friday, I offered to put something up on their facebook page. Curator Helen took me to the store to see what she could find. “You’re interested in books!” She enthused, as she brought out a small miscellany of the museum founder’s collection. I carefully opened one book and was immediately entranced. It was a mediaeval picture book from the era of Queen Elizabeth I, 1563, at a time when printing presses were gaining in influence across Europe. The book was a pictorial version of Ovid’s Metamorphoses (1), called "In Tetrastichi Ovidii Metamorphoses". Each page had detailed woodcut. Above the picture were four lines of poetry in Latin. Below the picture, were four lines of descriptive poetry in German blackletter font. And below that were handwritten notes in old English, again interpreting the rhyme. Pictures, old fonts, and ancient handwriting. I was caught; hook, line and sinker! After 451 years, the paper was fragile. Fortunately I had my camera with me. Without fully opening the book, I carefully began photographing it page for page, with the help of the museum’s tripod. Two hours later, my legs had almost seized up from standing in the same position. The raw image files were copied to the museums digital store. The book could now be studied from the images without subjecting the original to further risk. Back home, I edited the images and compiled a PDF version on behalf of the Norris Museum. The whole book is now available and accessible to all online, in the Internet Archive, at https://archive.org/details/OvidMetamorphoses1563 (2). A small suggestion had grown into a larger project. The book is “In Tetrastichi Ovidii Metamorphoses”,a popularisation of Ovid’s “Metamorphoses” or tales of change. Further investigation on its creation revealed an involvement of people and places not expected from an apparently simple picture book. 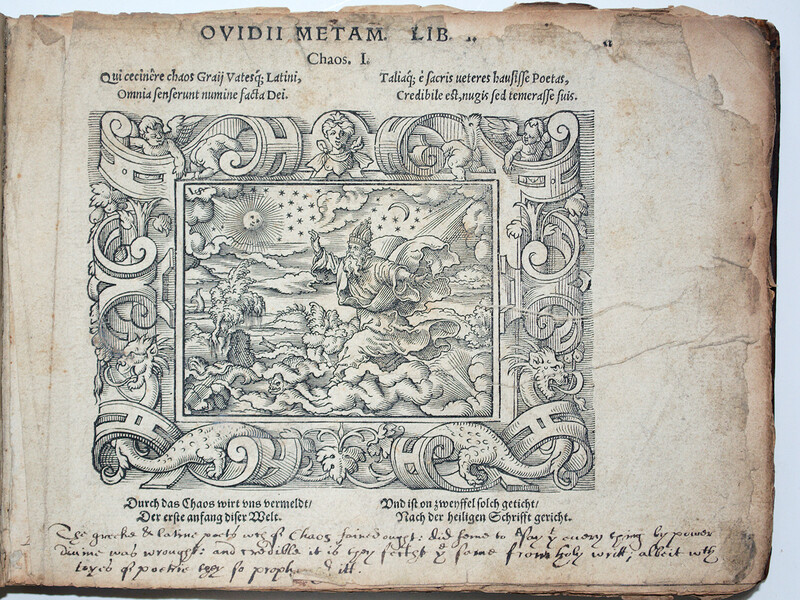 In Tetrastichi Ovidii Metamorphoses was published in 1563 by Georg Coruinus, Sigismund Feyerabent, & haeredes VVygandi Galli. In the same year, they also published a prose version of Ovid’s “Metamorphoses” (3). Both books include woodcuts by the engraver Virgil Solis. However, in the Norris picture book, the original engravings are framed by additional elaborate woodcut borders (4). Solis was a prolific Nuremberg engraver who had died in 1562. His woodcuts would grace 25 further editions for another 90 years after his death. Since the pages contain both printed text and illustration, it is most likely that the inked set type and the woodcuts were placed together on the pages, to be printed simultaneously (5). There are tetrastich poems (poems in 4 lines, also known as quatrains) in Latin and in German, written by Johannes Posthius of Germersheim, Germany, above and below each image. At this point in his career, he was destined to become the personal physician to the Duke of Alba and then later the Prince Bishop of Wurzburg. In later life he became a poet laureate (6). Johannes Posthius’ dual interests in poetry and medicine are already apparent in the Latin introductory dedications for the book. The first was by Karl Hugelius (Latinized as Carolus Hugelius), a German physician, with meagre known references dating from 1598 to 1613 (7). The second introduction was co-authored with the Viennese poet laureate of the day, Johann Lauterbach (8). Mystery surrounds the English handwriting that graces most of the pages of the book. We do not know the author or how the book came to England. However, such illustrated works were very popular in the 16th century and the German presses were very prolific. Presumably the subject matter was also relatively safe in an era where the printed word was under strict control and needed to avoid the jaundiced eye of both the rulers and the printing guilds. Since the invention of the Gutenberg press with movable type, around 1452, printing had flourished throughout Europe. Germany and Italy were major printing countries with hundreds of presses printing millions of pages. (9). It was astute of Gutenberg to ensure that the first printed book was the Bible! Both the clergy and secular rulers could see the advantage of printing, not only for educational purposes but also to spread their message. The printers themselves wanted to protect their trade too and formed their own guilds. 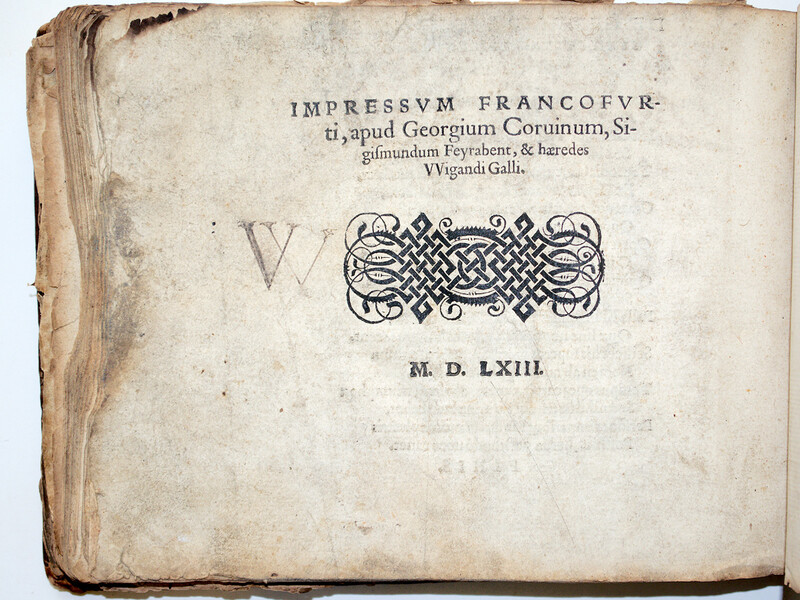 The printed word also had the capability of spreading new ideas, as seen by the Reformation spreading like wildfire throughout Europe. Germany was now a hodgepodge of Dukedoms, kingdoms and free city states (10). This did seem to permit a lively variety of opinion, dissent, if not freedom for the printed word, as long as was printed in the appropriate place. After William Caxton had learned his trade in Bruges and printed several English works there, he came to a slightly different environment when granted an indulgence to print in England in 1476. The state ensured considerable control of what could be printed and by whom in England either directly or through the Stationers Company. Typically, 20 printers were permitted within London. The universities Cambridge and Oxford were also granted a licence to print certain works, although Cambridge did not begin printing until it gained a master printer in 1584. Imprisonment and fines were the consequences of non-compliance (the first executions did not occur to the 17th century)(11). There are remarkable similarities with the current information revolution and its effects on developed and developing nations and governments via the World Wide Web. Now as 450 years ago, rival ideas, opinions and ideologies wage battles in print and pictures for the hearts and minds of the readers. Overall, printing was a great liberator and educator - hopefully that will be the legacy of the internet too. I hope that this has given you a brief glimpse of the information strands and potential for research initiated by a chance comment and find in the Norris Museum, St Ives, UK. This is something exceptional sort of data for the general population and this kind of the activity is something past but you can get bestdissertation review for best work. The basic personality did not comprehend the things but rather I realize you compose this article since you need to pass on the one of a kind data.